Flat and FENCED-in yard is great for children and guests of all ages! Located on a rare, FLAT, newly FENCED-in lakefront lot on Lake Rabun, “Little Lakemont” is a two-story, family-owned home in the scenic Northeast Georgia Mountains. Bring your bathing suits and a carefree attitude to this quiet section of the lake, where your only task is to relax and enjoy the beauty that surrounds. This immaculate home, located less than two hours north of Atlanta, sleeps up to 9 guests, ideal for a family vacation, weekend getaway or a girls-only escape. Little Lakemont is tastefully and comfortably furnished, with an ability to accommodate a crowd, if needed, while still offering cozy privacy to its treasured guests. 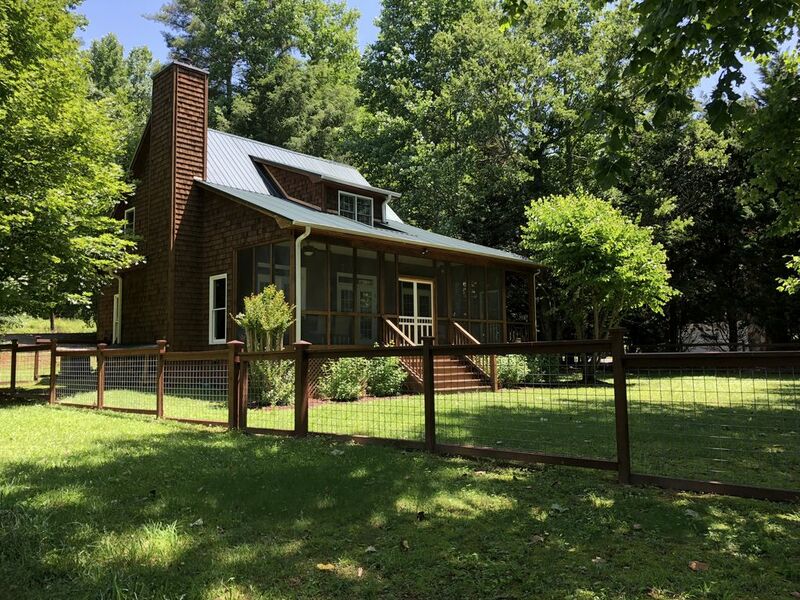 Easily accessible year-round via paved Lake Rabun Road (trust us, this is a perk! ), Little Lakemont has ample parking and no daunting flights of stairs to the house or to the lake (perk! perk! perk!). Our large, flat fenced-in back lawn is perfect for running around playing tag, roasting marshmallows in the in-ground fire-pit or squaring off in a game of Giant Jenga, Horeshoes or Corn Hole (all provided! ), all under the shade of the Sycamore trees that border the lake. Relax on the screened-in back porch – where we bet you’ll spend the majority of your time – with unobstructed views of Lake Rabun, as you and your guests enjoy the peaceful calm of “The Narrows” and its no-wake zone, making swimming and water recreation worry-free. Explore the water via our 3-person, 17-foot canoe or 1-person, 15-foot kayak; or stay grounded and make use of our charcoal grill and lounge chairs. Our covered boathouse offers sunbathing or relaxing in the shade, and Little Lakemont allows you to bring your own boat and tie up at our dock. Or talk to Michael at Lake Rabun Boat Rentals (706-782-4438) or Hall's Boat House (706-782-4981) to rent a boat or jet ski. (Just be mindful of the no-wake zone in The Narrows, and be sure to wave as friendly “neighbors” pass by in their boats of choice as Southern Hospitality is on full display here at Lake Rabun). As you enter Little Lakemont through the front door, you’re welcomed immediately by the open kitchen and dining area that overlooks the family room. Cook (or, simply eat) to your heart’s content with all the pots, pans, plates and utensils one could need; and for the more adventurous, make use of our ice-cream machine, slow-cooker or blender. The kitchen features a gas-burning oven and stove, dishwasher and garbage disposal. If by chance you aren’t taking your meals on the six-seat dining table on our screened-in porch (which features our second charcoal grill), our indoor dining table seats eight (five chairs and one bench) for casual meals. We also have a restaurant-style high chair available for your use, if needed. The family room is cozy and inviting with a new couch (which folds out to a full-sized bed) and new swivel/rockers, all of which are working hard to divide their time between the entertainment center (stocked with a 43-inch TV, books, movies and board games) and the real star of the show, a floor-to-vaulted-ceiling stone fireplace. The two guest bedrooms are also located downstairs. One features a pillow-top queen bed and ceiling fan, and the other – in true Lake Rabun fashion – bunk beds with easy and fun access to the top bunk via the built in steps/drawers (BONUS: the bunk room has a giant Connect Four game mounted to the wall - so much fun for kids and kids at heart!). Both bedrooms have plenty of closet space and storage, and the comfy beds are nicely appointed with new, crisp linens and comforters. These bedrooms share the immaculate main-floor bathroom, which features a new vanity, large (stocked) linen closet and shower/tub. If a quick load of laundry is on your agenda, a washer/dryer combo is conveniently located on the main floor near the bathroom. The master suite, with a king-sized bed ceiling fan and spacious bathroom, is located on the second floor, offering quiet seclusion from the rest of the home. If you’re tempted to watch television, the cleanly appointed master bedroom features one of the two TVs in Little Lakemont, housed in the armoire. Just outside the master is a sunny reading loft, where an overstuffed leather chair and ottoman invite you to settle in and enjoy a good book (or take a nap) with views of Lake Rabun and the boathouse just below. Also on the top floor is a small, gabled bedroom with a single bed, perfect for a child (or an adult who would prefer the privacy of his/her own room versus the pull-out sofa in the living room!). There’s plenty of space in this bedroom for a pack-and-play (not provided) for the littlest ones. There will be no need to leave Little Lakemont once you arrive, but there’s plenty of exploring at your fingertips, should you feel compelled to wander. Enjoy Angel Falls (you can walk from our driveway to the trailhead), Minnehaha Falls (a short drive to the trailhead), Tallulah Gorge and Black Rock Mountain State Parks, all offering hiking trails and pristine views. Hall’s Marina, Lake Rabun Inn and Restaurant and Louie’s on the Lake are a short drive away; historic Lakemont beckons with its quaint shopping area, art and cafés; and plenty of creature comforts are available in the nearest city – Clayton, Georgia – as well as antique shops and family-owned restaurants. We consider Little Lakemont our favorite place on Earth, and we respectfully offer its charm and hospitality as you plan your next mountain retreat. We are The Schroders! Billy's family has been enjoying Lake Rabun since the 1940s, and we are blessed to now have our own little piece of paradise to share with our daughter, Haly Jean. And you! It's not often you find a house on Lake Rabun on a flat lot, as many are perched on the side of a mountain. Couple this unique attribute with the house having direct access from Lake Rabun Road and being in a quiet section of the lake where we feel comfortable with our little girl learning to swim, and buying this house (what we call Little Lakemont) was the easiest and best decision we ever made. We recently had the backyard fenced in. This has proved a HUGE convenience while our daughter plays outside. This is a HUGE plus during the summer months, as not every property has central air conditioning. Indoor dining table for 8; outdoor dining for 6. Wonderful place for family time and unwinding. Everything here was as good or better than expected. The home and property are beautiful and very comfortable. We had a wonderful time. We come to this area every fall to see the fall color and to our holiday shopping buying unique and beautiful crafts. I am so glad we discovered Little Lakemont. The house offers everything you need. The beds are very comfortable. We enjoyed sitting on the boathouse deck watching the sunset each evening. Having access to the canoe and kayak was a benefit. If you are looking for the perfect lake house you must stay at Little Lakemont. I love hearing y'all come to the area every fall! I've been going to the lake all my life -- long before we got Little Lakemont -- but somehow, never in the fall. My wife and I finally got to see the place as the leaves were about to change a few weeks ago. It became our new favorite time to be in the mountains. We're glad you had a great time and found Little Lakemont so much fun. We hope to see you next year. Perfect place on the lake! We loved our long weekend at Little Lakemont. The house is perfect. Clean, charming, and easy. The location is amazing and the fenced in yard is super. The house has everything we needed. We will be back! Thank you to the owners for allowing us to stay in your beautiful home. Clean. Very comfortable. Beautiful views. Relaxing. We're so glad y'all had a great time. And congratulations again on your daughter's wedding! Our family had an amazing time at Little Lakemont. This house is right on the lake with a beautiful boathouse. The house was beautiful on the inside and had everything we needed. Our kids (9 and 6), enjoyed this trip very much. They really loved the kayaks that were provided with the rental. We enjoyed all of the hiking around the house and even rented a pontoon boat from Michael at Bear Gap Outfitters. This was our first time renting a boat and Michael made it so easy. He showed us everything we needed to know and it turned out to be very easy- entire family enjoyed exploring Lake Rabun. We would stay at this house again, no doubt about it. That makes us so happy to hear you had a wonderful time! Lake Rabun is the best. We can't wait to get up there again in a couple of weeks. Our little girl loves the kayaks, as well. Such a great way to explore the upper regions of the lake. Little Lakemont was truly a perfect place for us! We spent most of our time on the lovely Boathouse enjoying the perfect view and quiet cove. Couldn't have been a better location for our kids. Everything was clean inside and very accommodating! Laura and I are so happy y'all had a great time and enjoyed the Boathouse as much as we do! Reading how much fun y'all had makes it even more difficult waiting to get up there next month! We hope to see you next summer.